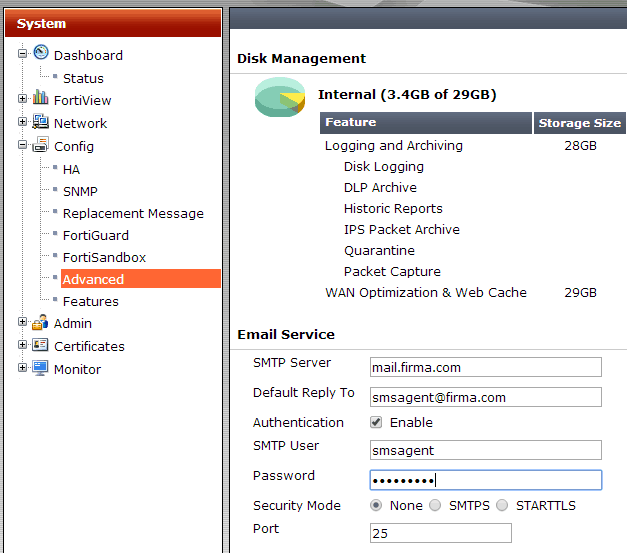 Here we describe how to setup FortiGate with SMSEagle for SMS notifications. FortiGate integration uses Email To SMS plugin (see details: Email To SMS plugin). To configure Email setting choose Config -> Advanced from the left menu System. Check If your SMTP server requires authentication, enter the username and password in these fields. To configure choose Admin -> Administrators from the left menu System. Contact Info Enter email and phone number. Notice: SMTP server on the SMSEagle device will accept messages addressed for it only. The other messages will be rejected.